I know exactly where I was on the night of June 9, 1988: sitting in the family living room with my father and brother, watching George Carlin’s 6th HBO special, What Am I Doing in New Jersey?, a live performance staged at the Park Theater in Union City, New Jersey. A master comedian, Carlin often combined social commentary with hilarious observations about everyday life, from politics and religion to humorous license plate slogans. In a career that spanned 6 decades, Carlin established himself as one of the funniest (if not the funniest) stand-up comics ever to take the stage, and What Am I Doing in New Jersey? features some of his best routines. 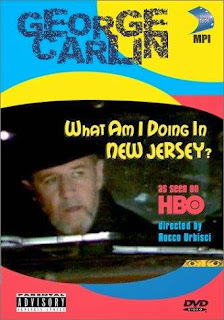 After a filmed sequence in which he hops into a New York taxi and tells the driver (Robert N. Altman) to take him to Jersey, Carlin kicks What Am I Doing in New Jersey? off with his selection of “People I can do without”, a list that includes “a proctologist with poor depth perception” and “a cross-eyed nun with a bullwhip and a bottle of gin”. After launching into a tirade against the “criminals” in the Reagan administration (a sequence that, while still funny to those of us who remember the ‘80s, won’t mean a thing to younger viewers), Carlin next delves into one of his favorite topics: keeping people on their toes, where he offers advice on what to do to ensure those around you are paying attention (like asking to see the manager the next time you’re at a wishing well. “Tell him you've been coming there for 10 years”, Carlin says, “and none of your wishes have come true. Either you give me my money back or I'm shitting in the well”). And, of course, no Carlin special would be complete without a rant about driving and the people you encounter on the open road, like “the guy whose turn signal has been on since 1955”. From 1977 to 2008 (the year of his death), George Carlin produced 14 stand-up comedy specials for HBO, most of which are hysterical (1982’s Carlin at Carnegie features a reprisal of his most famous routine, “Seven Dirty Words You Can’t Say on Television”). Of them all, What Am I Doing in New Jersey? is my favorite; I’ve seen it at least a dozen times, and it still makes me laugh so hard that I cry.